Macon is located at the head of navigation on the Ocmulgee River in the center of Georgia. In 1860, on the eve of the Civil War, Macon was a business community dedicated to supplying the needs of its citizens, of the cotton planters who grew the short-staple upland cotton, the principal foundation of wealth for the antebellum South. This amazing diversity would serve Macon well in the desperate struggle that was to come. 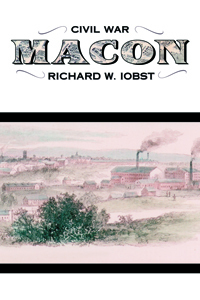 Now, for the first time in such detail, is the story of Macon, Georgia, during the Civil War. What was life like in Macon during the war? What kinds of industry supplied the Confederate army? Why did Sherman not come down to Macon? What of Wilson’s raid through Middle Georgia? These answers and much more fill the pages of Richard Iobst’s very readable narrative.